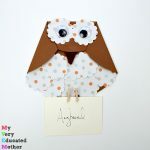 Make this Cute Felt Owl Mask for Young Children who may not like the hard scratchy commercial masks. 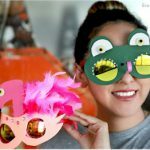 This mask is definitely an owl but it can be made in fun colors like this one made from violet red felt. Cut an owl head shape from a piece of violet red felt. Cut two round circles from a piece of pink felt. Cut a triangle shape from a piece of yellow felt for the beak. Place the pink round felt on the violet red felt and cut out two drop shape holes for the eyes. Sew the pink felt and the violet red felt together with needle and thread. Sew the yellow felt triangle with yellow thread. 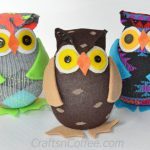 We cut some blue and green felt drops and glued them on the violet red one with a glue gun, but you can decorate yours any way you like. Cut two pieces of brown felt in the shape of eyelashes and glue them on the pink one with a glue gun. Glue the yellow felt triangle beak on the violet red one as the nose. Sew the pink felt circles to the violet red felt around the eye holes. Sew a pink ribbon on your mask and watch the kids have fun. Pandahall Learning Center is a large and free active online community on jewelry craft knowledge sharing. It collects thousands of jewelry making projects, techniques instructions about beading, wire wrapping, braiding etc.,as well as craft ideas and customer shows.